If you are looking to savour Chinese Specialities on a Saturday afternoon look no farther than Long Yin , an opulent Chinese restaurant located at Le Meridien Dubai Hotel & Conference Centre Airport Road. Living in Singapore for almost 5 years my palate is no stranger to authentic Chinese cuisine so when we visited Long Yin of course we expect nothing less than what this restaurant is famous for - traditional Cantonese and Szechuan cooking at its finest. When we enter Long Yin, what caught my attention first was the authentic Chinese interior, there was also a relaxing Chinese music playing on the background that added to the genuine feel of a traditional Chinese restaurant. The ambience itself promises an enjoyable and comfortable afternoon dining experience. 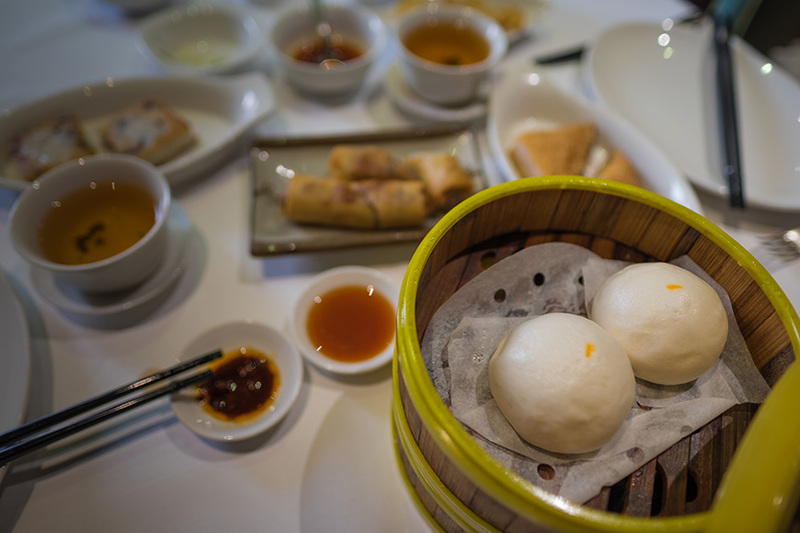 After the accommodating staff ushered us onto our table and when we were already settled, we were given Long Yin's menu that boasts all their specialities and a dedicated section to their vast range of steamed and fried dim sum. While we're deciding on what to order we were served hot green tea with jasmine and oolong tea that further set the mood for a promising afternoon. We placed our order for a combination of steamed and friend dim sum. We ordered chicken and shrimps dumpling with Chinese chives, red bean bun, crispy prawns, vegetable spring rolls, radish cake with dry shrimp and prawn on toast which is my personal favourite. Browse the full menu here. When the dim sum arrived we were amazed with the presentation, not only its aromatic but also a work of art that we can't help but appreciate. The way it was presented and set-up on our table definitely aroused our appetite. We savour every bits and pieces of the dim sum and we can't seem to get enough so we ordered another round, since it's all you can eat dim sum we figured that we should eat to our hearts content. The dim sum were cooked to perfection, the aromatic flavour filled our senses and the delicious food definitely satisfied our cravings. You can feast on All You Can Eat Dim Sum every Saturday from 12:30pm to 2:45pm at Long Yin located at Le Meridien Dubai Hotel and Conference Centre in Garhoud. The Dim Sum Banquet is priced at just AED 119 with an option to buy 2 Tsingtao beers and get 1 for free. For reservation visit longyin-dubai.com or call +97142170000.